You may use the RBC12 Replacement Batteries or the following kit listed below for the RBC12 Cartridge Batteries. Length 5.94", Width 2.56", Height 3.74" (Total Height 3.98"), F2 terminals .250", Approx Weight 40 lbs. 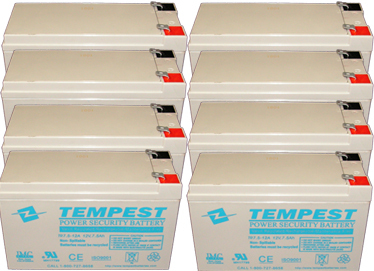 Guaranteed to meet or exceed APC RBC12 Cartridge Batteries specifications and performance. All RBC12 Cartridge Batteries are new. We do not sell refurbished batteries.